Reach your weight goals with the most accurate body composition readings. Automatically uploads body composition data over Wi-Fi. Gives high-accuracy measurements via Position Control™ technology. Stay motivated to achieve your goals by taking advantage of a smart scale that tracks more than just weight. Track weight, BMI, total body fat and water percentage plus bone and muscle mass. Set a weight goal and manage your daily calorie budget with integrated nutrition tracking. Recognizes and records data from up to 8 different users with independent sync. Patented Position Control™ technology allows for the most accurate readings. Just step on, and on-screen arrows guide you towards the correct stance. An app to track all of your health data. Once you tell the app your target weight and how fast you want to get there, it will calculate the number of calories you can eat each day. Log meals to keep on top of how many calories you can spend. To keep you moving, your daily budget will automatically increase based on how active you are. The scale shows a trend screen, and the app delivers personalized advice, badges, reward animations, and weekly reports. The seamless scale/app experience helps keep you motivated. Connect the Health Mate app with the Nokia line of health products for a seamless health coaching experience. Nokia works with most Apple or Android devices. 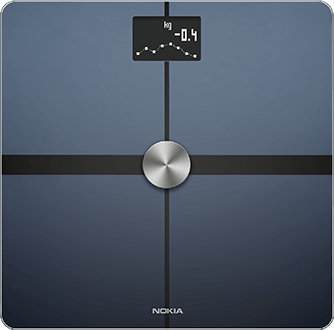 Go to the Bluetooth settings on your device and pair the Nokia Body+ Scale with your device. Track all of your health data in one place using the Nokia Health App.